The advent of new technologies and approaches (e.g. combination electroacoustic devices, middle-ear devices, bone-anchored hearing aids) now means that recommending the best technology for individual clients has become increasingly complex. This Key Project is analysing pooled patient data to determine an evidence base for unilateral (single ear) and bilateral (both ear) device fitting for children, adults and the elderly with different types of hearing loss. From this data, we will develop clinical tools to assist clinicians in decision making – this will extend to identifying which clients can benefit from trainable hearing devices. A focus of concern in Australia is around the appropriate provision of hearing healthcare to our ageing population, and a sub project will be investigating how to identify whether elderly hearing aid wearers should be recommended one or two devices. This project is investigating which of the increasing range of hearing devices (cochlear implants, acoustic hearing aids, bone-conductor hearing aids, bone-anchored hearing aids, middle ear implants and hybrid devices) should be fitted/implanted to patients with different types of hearing loss along with other characteristics and considerations. This project is determining who are the candidates suitable for trainable hearing aids or cochlear implants and how clinicians can most efficiently discern suitable candidates for these devices. XR3.1.3 Bilateral Aiding and Bilateral Interference. This project is providing new insights into which elderly hearing aid wearers should have one versus two hearing aids. 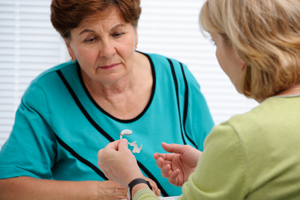 A secondary aspect of project is determining whether a DDDT (dichotic listening) test can be used to predict, prior to hearing aid fitting, whether a patient will function better with one or two hearing aids.